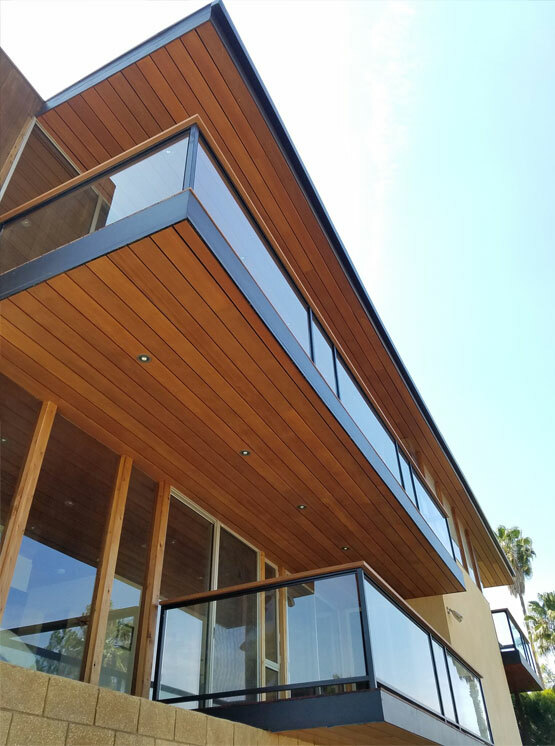 We have been extremely impressed with Danny’s expertise, design ideas, reliability, caliber of his carpenters, final product, and willingness to make his customer happy! The overall experience was seamless from beginning to end. 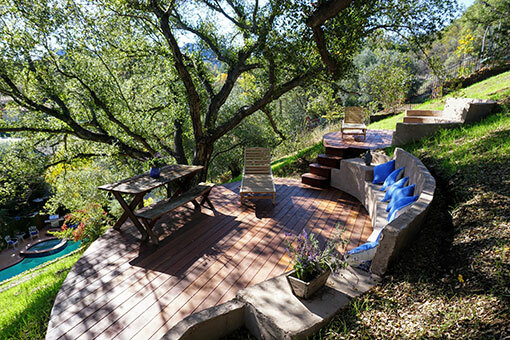 He designed two mangaris wood decks on a very steep hillside that turned out not only beautiful but very sturdy. 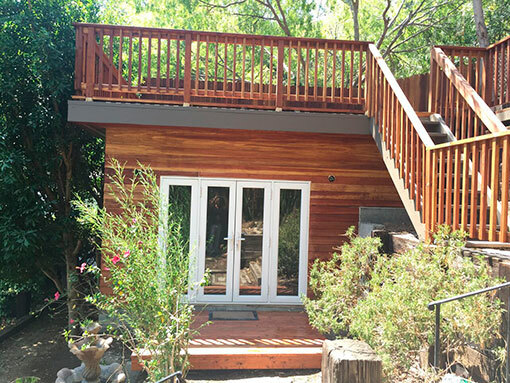 We were so happy with the decks that we hired him to complete a wood balcony off our master bedroom as well. This turned out beautiful as well! Overall the project couldn’t have gone any better. The work was performed as agreed and within the time frame (4 weeks) initially discussed. Workers were clean, friendly and punctual. Danny was involved in every step along the way and was very good about keeping me updated on progress and providing recommendations. This was our first big project at our new house and my wife and I are so happy with the final product. Bottom line, you would be doing yourself a disservice not to engage Danny for any deck construction or maintenance. He and his team are great. Danny and his team are amazing! 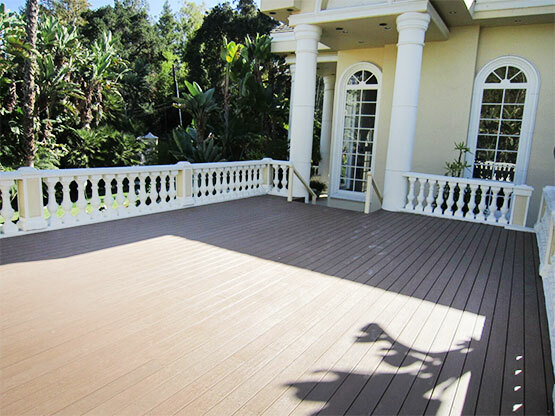 The 3 decks look beautiful and this was a very complicated job because of the architecture of the house. There were lots of details to work out and they went above and beyond to make sure the end product was amazing. We’re finishing up the project now and moving onto a new project as I write this. Danny Deck is great…if he’s available I’d hire him without a second thought! 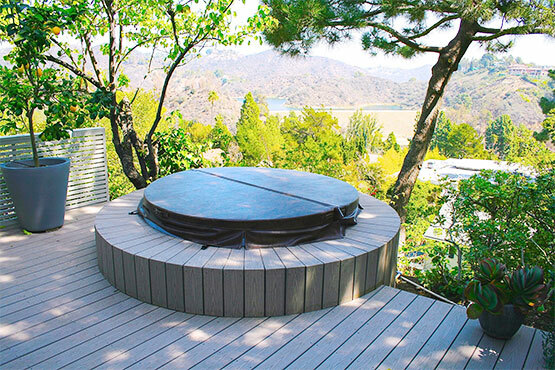 We live in Bel Air and Danny Deck built a work of art for our new hot tub enclosure. The crew was great and spent a great deal of time getting it right and maintaining the high quality that the rest of the house displays. I am sure that very few contractors would have come up with the idea let alone had the skill to execute it. Great job Danny!! Glad we found you on Angie’s List. I actually interviewed three professionals for this job (all from Angie’s List) and ended up going with Danny Deck. I chose Danny because he was so knowledgeable and a bit more concise with his thoughts on building a new deck and repairing other problems in the surrounding area. I also liked Danny’s attitude and personality, knowing full well that this would be the man I would be conferring with during this project. I can’t say it was a joy to part with $30,000.00, but it was definitely an easier transition because of Danny’s great demeanor. Each one of Danny’s employees showed the utmost respect not only to me but also regarding my property. Before the workers left at the end of each day, they cleaned the surrounding areas and left my property neat and orderly. Each day, Danny would stop by and inspect what his workers had accomplished. If I had any problems with anything, Danny would say “Don’t worry, this will be corrected. 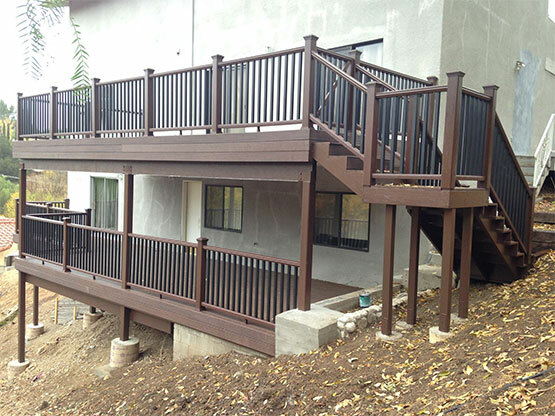 We are here to make you happy with our work and to make your deck beautiful”! And that he did!!!!!!!! Being a homeowner for the past 25 years, I have come into contact with all sorts of people who have repaired or replaced different elements on my property. Without a doubt, Danny Deck holds the record for a stellar job on constructing my new deck. 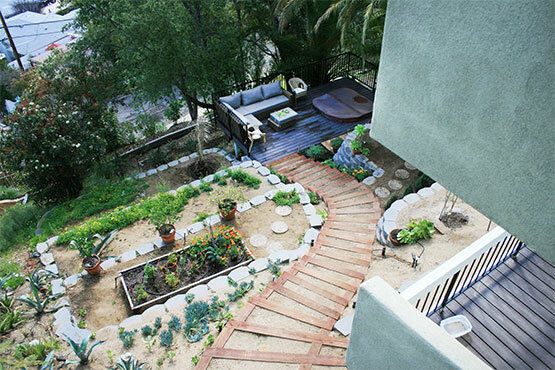 I wholeheartedly endorse Danny Deck to anyone that is in need of a beautiful outdoor space. Danny created a visual beauty that I will enjoy for years to come. Oh! Did I mention that everything has a lifetime guarantee? Doesn’t get any better than this. Don’t hesitate to call Danny Deck. You’ll be singing his praises just like me! One SATISFIED customer. Thank you DANNY DECK! Working with Danny Deck Construction was an absolute pleasure and on top of that Danny has a great eye for design and adds good ideas into the mix. We did this project via email and phone calls mainly from New York to LA – so it had added complications which Danny made irrelevant. A fabulous experience all round. It has made me want to build more but I have nothing else to do right now! Thank you. Couldn’t have been better – Danny was collaborative as this complicated project evolved. He always suggested the best solution and executed those solutions well. One of the things that made this project especially tough was a combination of a steep hillside and 80# masonry blocks used for retaining walls – we must have used 10-12 pallets of masonry block and it was installed during a very hot part of the summer. Danny always communicated well, Danny was present on the job site when he needed to be, and had a very talented foreman and crew who really knew what they were doing. I would not hesitate to recommend Danny or use him again. Danny & his guys pulled out an old redwood deck in our backyard, along with all the debris left behind from a previous renovation. 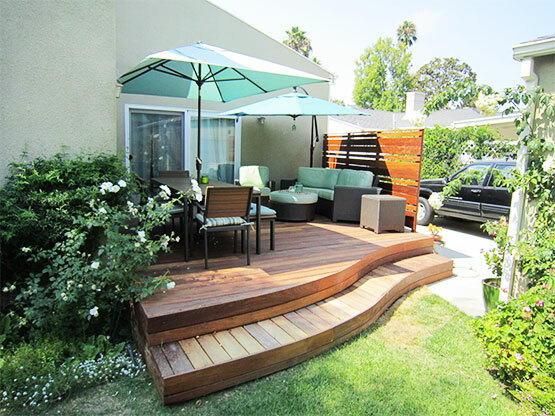 Based on a design we created, they built from the ground up a new deck made from IPE wood, a very dense hardwood, very weather- & infestation-resistant. His guys were great, very respectful & professional, even helping with some gardening work, removing some bushes & rerouting sprinklers, and they always cleaned up the work site every day. Danny showed up on any days we needed to make decisions and was very flexible with any changes. Such a pleasure to work with, low pressure, easy-going and thorough. Also timely, as they finished on their promised date, and on budget. We highly recommend them! We had a number of contractors come out to give us estimates before we decided to go with Danny Deck Construction so we had a lot of others to compare to. 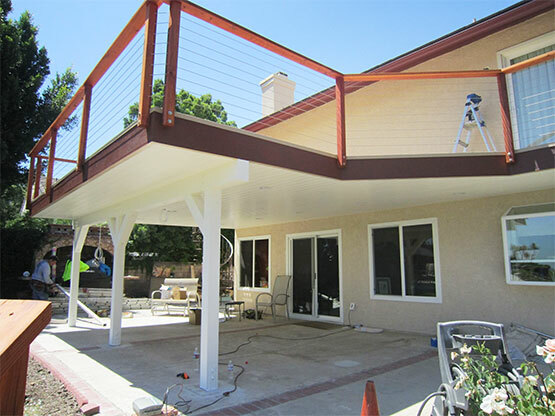 We decided to go with Danny Deck Construction and we are extremely happy and satisfied with every aspect of the job on our decks. Danny is extremely professional. He gave us a lot of options on our remodel–from high end to more economical options and price points. His team works very fast and are always out of the way. even on our huge project. The project was a big one but it was completed quickly. 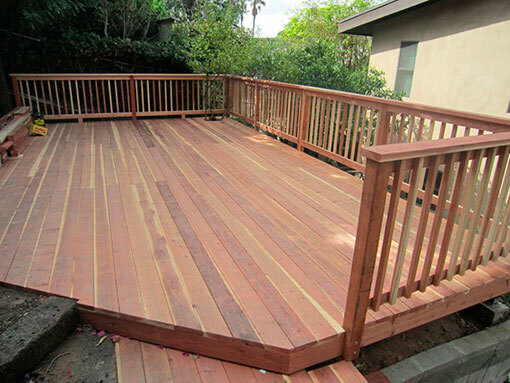 Danny spent a lot of time going over decking options with us and helping us pick what we liked. He had great design ideas as well and put us in touch with an electrician to work on our lighting for the lower deck. We could not be happier with the outcome. We would recommend him to anyone and we will definitely be using Danny Deck again for more projects. After checking out other deck builders, (some who never returned the call) Hannah from his office called to schedule an onsite estimate within one day of receiving my inquiry. Danny was knowledgeable, professional and discussed varying options with me. His bid came in soon thereafter. It was within the price range we had discussed, and fully outlined the job – all the way through removing and dumping all construction debris, legally”. Danny and his crew arrived as scheduled, on time with a clear timetable, that I could understand. Every crew member was professional, gracious and were true craftsmen. The crews worked efficiently and were pleasant. Every day, the site was cleaned, swept and materials were stored to be out of the way. The job took exactly the length of time as planned. The work is perfect and the deck is beautiful. If you are looking for the highest quality work, then know you get what you pay for and more. I would highly recommend Danny Deck.